The natural sweetness of carrots is well matched here with pumpkin seeds and sultanas. 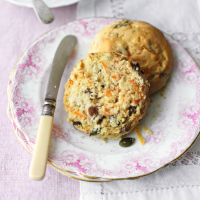 Try these scones with a herbal infusion for a light afternoon tea. 1. Heat the oven to 200°C, gas mark 6. Sift the flour and baking powder into a large bowl and, using your fingertips, rub in the olive spread until well blended. 2. Stir in the sugar, carrots, sultanas and pumpkin seeds, then make a well in the centre and pour in the milk and vanilla extract. 3. Using a table knife, bring the mixture together to make a firm dough. Pat out to a thickness of about 2cm and, using a 6cm cutter, stamp out 8 rounds. 4. Transfer to a non-stick baking tray, brush the tops with milk and bake for 15-18 minutes, until risen and golden. Leave to cool on a wire rack before serving.